CalendarPal by Cloudeight is a personal desktop calendar, events calendar and organizer program, making it easy to deal with and organize your schedule, keep track of events, create daily notes, reminders, "To Do" lists and more. 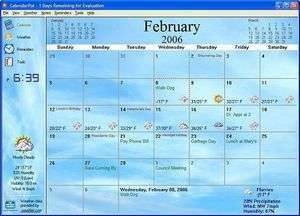 Plus, CalendarPal puts your local weather right on your calendar and your system tray. Add daily notes, reminders and alarms, view your local weather, browse from year to year and month to month easily, change themes, and more! For security reasons, you should also check out the CalendarPal download at LO4D.com which includes virus and malware tests. Additional screenshots of this application download may be available, too.